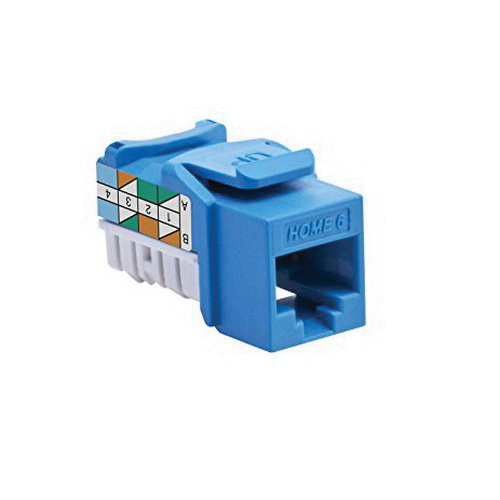 Leviton Home 6® QuickPort® Category 6 Modular UTP jack connector is ideal for high Megabit applications. Surface/flush mountable jack connector in blue color, features high-impact plastic construction. It has a dimension of 0.63-Inch x 1.18-Inch x 0.58-Inch. This connector is suitable for use in conjunction with other QuickPort® snap-in modules for voice/data and video applications over UTP, coax as well as fiber. It offers network connections for Cat 6 UTP structured cabling systems in a wide range of residential applications. Connector allows 568A/B type wiring for improved functionality. It is V0 flammability rated per UL94 to withstand harsh environmental conditions. Jack connector is cULus listed and meets ANSI/TIA/IEEE/ISO 9001 standards.